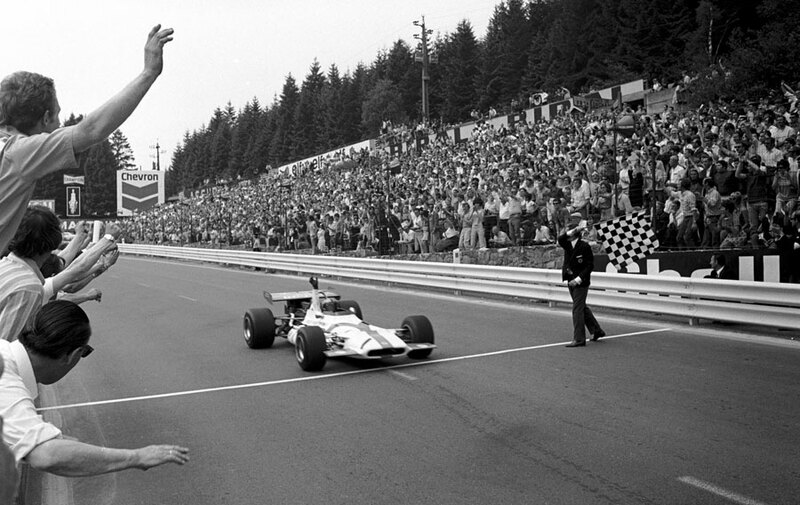 Pedro Rodriguez won the Belgian Grand Prix at Spa, bringing BRM their first outright victory for four years. This was a personal triumph for Rodriguez and his first win since the South African Grand Prix three years before. Yardley, the cosmetics firm, were beside themselves with excitement having sponsored BRM in the biggest comeback in the history of motor racing. The build-up to the race was overshadowed by the death of Bruce McLaren, who had been killed while testing at Goodwood earlier in the week. This left his eponymous team without a driver as Denny Hulme had been injured at Indianapolis a week earlier. Understandably, the team withdrew from the grand prix. Spa itself was under the spotlight. The 1969 race had been cancelled on safety grounds, and while there were a few signs of improvement, there were still issues, not least the absence of enough safety barriers. The race was in doubt until the last hour when a run-through by a driver gave it the all clear. Starting back on the fourth row of the grid, Rodriguez carved his way into the lead by the fifth lap, and was only briefly headed by early leader Chris Amon on the eighth lap. Amon harried and hounded Rodriguez lap after lap until he fell back in the final stages. The 8.76-mile circuit through the Ardennes forest took a toll on the cars and by the end only six of the 17 starters were still running. Early-season championship leader Jackie Stewart had another poor day as his March expired in clouds of smoke on the 14th lap. Jack Brabham, who came into the weekend heading the standings, left Belgium in the same position even though he too was forced to retire with clutch problems. Jacky Ickx, still suffering from burns he sustained in Spain, quit when fuel started pouring into his cockpit.